One of things I like best about packing my kids' lunches is that I get to control how much packaging and waste I'm using. 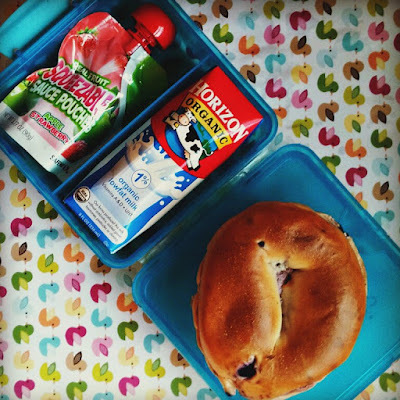 With reusable lunch containers I not only eliminate the need for paper plates or plastic sandwich bags, I can also buy things like crackers, cookies, chips, tomatoes, cut-up veggies, and even yogurt in economy packages instead of individual packages, saving both money and packaging. In theory, anyway. There are still days when I pack individual juice boxes instead of filling up a water bottle, or give in to applesauce in squeezable pouches instead of spooning it from a big jar into a little container. But I've come a long way from the days when plastic sandwich bags and plastic water bottles were one of my grocery staples. Every little bit helps, right? Boracay Island, one of the crown jewels in the Philippine archipelago, has once again landed on a Best Beaches list -- this time it's TripAdvisor's 2013 Traveler's Choice Awards for Best Beaches in the World. With all the global attention it's getting, even though it will never be as crowded or touristy as Venice Beach or Waikiki Beach, it would be a stretch to describe Boracay as "remote", especially if you first saw it fifteen, twenty or more years ago (as I did). For a truly remote island, you'll have to look elsewhere -- say, Camiguin Island. We visited Camiguin last December, and it really gave us city slickers/ suburbanites a refreshing taste of a slower, unspoiled life. Last week just flew by! What with coordinating Valentine's Day parties, crafting Valentines, supervising the arduous process of thank-you-note writing for the boys' birthday presents, helping The Pea choose her electives for next year, signing the kids up for summer camp, getting two root canals and catching a cold, I totally forgot to put up my weekly lunch post. 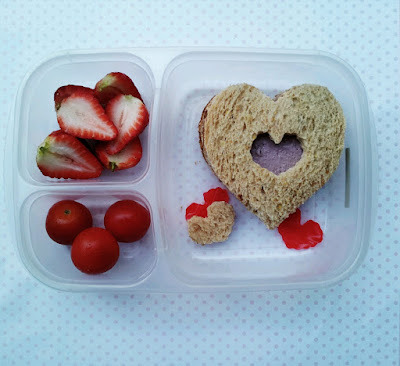 I really enjoyed putting together the kids' Valentine's Day lunches -- I did the whole cutesy red hearts theme -- and I just had to show the photo off today. Not that any of my other lunches are packed with any less love! 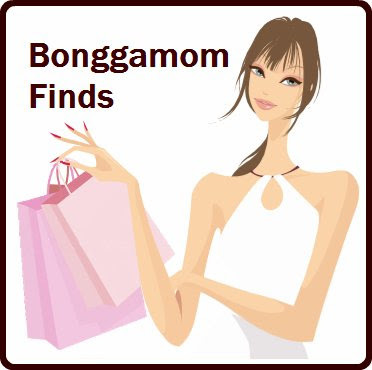 In a recent Silicon Valley Mamas article, my friend Robyn writes of a recent DIY Valentine backlash. I'll admit, I've noticed it too -- which makes it even weirder that I'm going in completely the opposite direction. Since The Pea was in kindergarten, I've been content to buy cheapo $3-for-24 Valentine cards from Target or Walgreens, but this year I just couldn't resist trying a few of the DIY ideas I've seen on Pinterest. 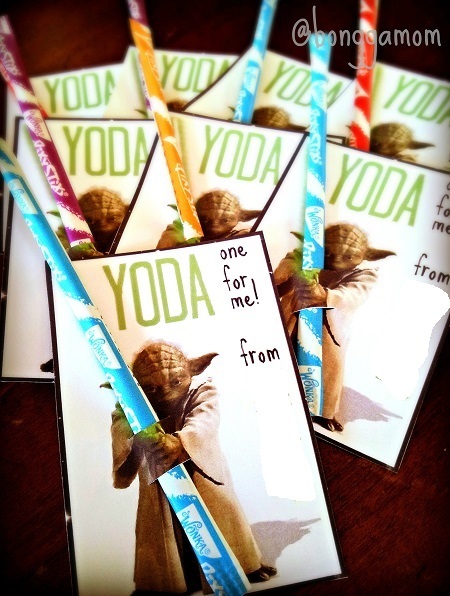 Yesterday I made some You Rock Valentines with some leftover candy from 3Po's party, and today I made some Yoda Valentines. 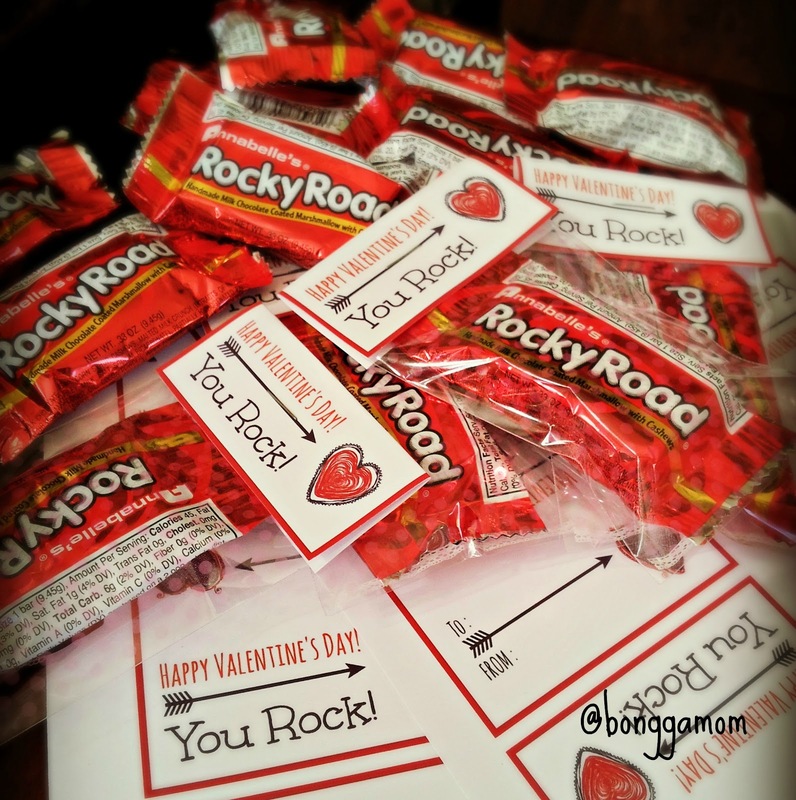 Valentine's Day Printables: You Rock! Valentine's Day is not a crafty holiday for me. I have never been a fan of handcrafting dozens of valentines for my kids' classmates. It just seems like too much effort (times 3 kids!) for something that just gets thrown away. My idea of crafty valentines is buying a $3 pack of Hershey's kisses, a pack of $3 drugstore valentine cards, and taping the kisses to the envelopes. But the adorable images of artsy, craftsy Valentines on Pinterest have been calling to me -- and since I had about a dozen leftover Rocky Road miniature bars from 3Po's birthday party (he had a rock climbing birthday party -- get it, Rocky Road? ), I decided to give them away as valentines rather than gobble it all myself. Last year I went all out for 3Po's and Jammy's 8th birthday parties. 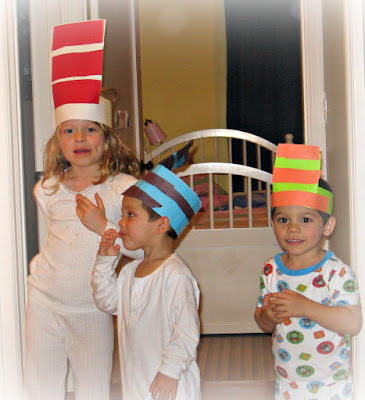 Each of them had themed parties at home, and I sweated over every detail, from the decor to the games to the cake to the food -- and since they held separate birthday parties for the first time ever, I did it all twice. This year, for their 9th birthday, 3Po and Jammy once again asked for separate parties, but this year I decided to give myself a break and outsource their parties to a local party place, so all I'd have to do was bring the birthday cake. Of course, it didn't actually work out out that way. Jammy decided on a party at a trampoline park, and I couldn't help it -- I had to do everything I could to fit a theme. 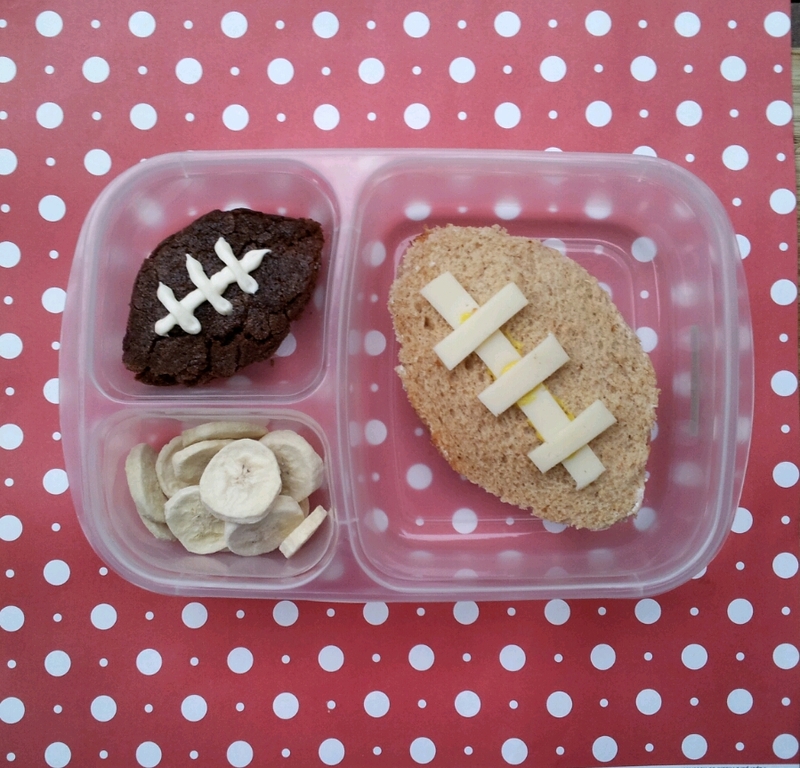 What's for lunch? Football, football and more football! Sadly, it was the Ravens that had the 49ers for dinner in New Orleans last night. Even though the 49ers were thwarted in their quest for their 6th title, I'm happy they rallied in the second half and gave everyone a cliffhanger of a game in the end. The San Francisco Bay Area is still rooting for the Niners, so even though the Superbowl is over, I decided to pack a fun, football-themed lunch for the kids today. I'm sure they'll all be talking about the Big Game over lunch anyway! Unfortunately, we weren't able to visit Boracay this time around, because while we were in the Philippines last month, a typhoon had grounded all planes to the nearest airport and suspended all ferry rides to the island on the day we were scheduled to fly there. We spent a miserable day at the airport, being shuttled back and forth from terminal to airplane, trapped in the cabin, waiting for the clearance to depart that never came. The typhoon was scheduled to last several days, so we figured that even if we were cleared to fly the next day, we'd be spending our entire Boracay trip watching raindrops pour and drip off our hotel room window -- and in the end, we made the decision to cancel our trip. Fortunately, there are 7,107 islands in the Philippines (plus or minus a few, depending on whether it's low tide or high tide), and Boracay isn't the only jewel in our archipelago -- and we managed to find another one that (almost) drowned out our disappointment at not going to Boracay.